Let's be clear from the outset. While the R40 Tour, which culminated with its final show in Los Angeles on Aug. 1st, may have marked the end of Rush's large-scale arena tours, it didn't mark the end of the iconic Canadian rock band, or their musical legacy. Still, fans can understandably be blue about it. For many, a Rush tour has come to epitomize the arena rock experience, and that reputation is refreshed and reinforced with each subsequent run. Consider their penultimate Clockwork Angels Tour. Supporting the album of the same name, the tour was a truly awesome amalgamation of lavish, tasteful lighting, custom-created video content spread across various surfaces, and a spectacular steampunk-inspired set design. Oh, and the music was pretty good, too. But touring on that scale - over 72 shows spread across three legs and eight countries - would take its toll on anyone performing close to three hours of technically demanding material on a given night, especially when they've been playing that material for decades. Despite their god-like status in the eyes of music fans the world over, bassist and vocalist Geddy Lee, guitarist Alex Lifeson, and drummer Neil Peart are nonetheless mortal, and touring has taken its physical and emotional toll on the trio. Peart, for example, has been rather candid in his comments about wanting to stay closer to home and spend more time with his family. But Rush wouldn't be Rush without its legions of die-hard devotees - those fans from a surprisingly wide demographic that appreciate the band's technical prowess, their continual quest to push the envelope, and the imagination that goes into each and every one of their creative endeavours. In what can only be considered a tip of the cap to those faithful followers, the band embarked on one final run of hockey barn burners to commemorate the four decades since Peart first joined the band and cemented their lineup. It was a run that began in Tulsa, OK on May 8th and lasted just under three months before the last stop in L.A. Thirty-five shows - five in their native Canada - and a set list that spanned over 40 years and every sonic era of this rock juggernaut. The concept behind R40 is something of a trip back in time, revisiting an iconic catalog of rock songs in reverse chronological order. The idea was to divide the band's career into five eras, those being: Clockwork Angels, big arenas, smaller arenas, soft-seat theatres, and finally, going back to their first shows in the early '70s school gymnasiums. Beginning with a handful of cuts from Rush's most recent studio offering, 2012's Clockwork Angels, the set list progresses through a string of commercial hits and crowd favourites in the opposite order of their respective releases. All the while, the set elements on stage change to reflect those eras massive walls of speaker cabinets for the big arena era, a proscenium stage with drapery for the theatre era, all the way down to a pair of amplifiers and a small drum kit (by Peart's standards) for the final songs. "We thought it'd be a cool concept to finish the night the way we started our career - in the simplest environment with virtually no props and just the music." Lee candidly shares with Canadian Musician. It was just about the music back then." But over the years, the tours grew more elaborate in tandem with the band's swelling success. The culmination of their ambition - conceptual, technological, and of course, musical - was the aforementioned Clockwork Angels Tour, boasting an imaginative steam punk design and three-hour setlist. ?With the Clockwork Angels concept, our live show had kind of evolved into its most complex point" Lee says. "There were so many twists and turns and complexities on the stage itself that it was kind of like, 'Where do you go from here? How do you keep getting more spectacular?'" The answer, as it turns out, was to devolve instead of evolve. "It seemed fun to use [Clockwork Angels] as a starting point and break it down from there - visit each era and the iconic things that were a part of that history, from set design to the amplification, all driven by the music from those periods." Choosing which songs would represent those periods was a significant undertaking, and understandably so when you have 40 years and 20 studio albums worth of material to consider. Lee says that they initially had different ideas of how the set list should come together - predominantly choosing deeper cuts to appease the die-hards versus a run-through of their biggest hits. Ultimately, though, being an anniversary tour that celebrates different periods of Rush, Lee says, I think you have to celebrate the highlights of those periods. And that's how we began picking our most successful, slash most popular, slash most loved songs. We tried to take our personal favourites out of the mix and focus on what our fan base really believes to be iconic." Following a video intro, "The Anarchist." a hard-hitting cut and one of the standouts on Clockwork Angels, kicks off each show as one of a handful of songs from the newest release. What follows is a series of cuts from Snakes & Arrows, with favourites from Counterparts, Roll The Bones, and Grace Under Pressure peppered in before the first set closes with the classic 'Subdivisions' - all part of the large arena component of the show. Lee points to the title track from Roll The Bones as boasting one of the more memorable moments of R40. Speaking to some of the notable technological innovations they've employed on the trek, he says: "One thing that was really cool was being able to sync video [in time with] the music. That's something we've always wanted to do, so we got a bunch of pals to lip sync the rap in 'Roll the Bones' in their own way." Those pals include actors like Paul Rudd and Jason Segel, musicians like Red Hot Chili Peppers' Chad Smith and Rage Against The Machine's Tom Morello, and fellow Canucks in actor Jay Baruchel and in character, the Trailer Park Boys. The montage is shown on the massive video screen at the back of the stage. "I'd always wanted a way to trigger that from my keyboard," Lee continues. "So I would trigger that part every night, so we always had the comfort of knowing it wasn't up to someone else to make sure that part was in sync with what we were actually playing." "It was a really special thing and fun for the audience," Lifeson adds. "I don't play during that part. so I'd just sit in the shadows and watch people enjoy it"
Between the two main sets is the hilariously irreverent "No Country for Old Hens" video segment, compiled from 15 years' worth of video content, much of it previously unseen. It features outtakes of the band members playing various characters from previous tour videos alongside equally outlandish celebrity cameos. The second set is split between the small arena looks, covering Rush's catalog from the '80s, and the theatrical looks for the mid-to late-70s. Loaded throughout this half of the show are classics like "Tom Sawyer," "The Spirit of Radio," "Closer to the Heart," and "Xanadu." It finishes with a true treat for the die-hards: four of the seven parts of the "2112" title suite. To most, the end of the theatre component would feel like the end of the show; however, it's followed by a short break and another humourous video clip, this one with funnyman Eugene Levy reprising his classic SCTV character Rockin' Mel Slirrup in a "new" edition of Mel's Rock Pile. What follows is an encore of early favourites from the mid-'70s that Rush fans will hold dear, including "What You're Doing" and "Working Man" from their seminal 1974 self-titled debut that even precede Peart's 40 years with the band. Outside of the hits Lifeson says they "needed to play," naming "Tom Sawyer" and "The Spirit of Radio" specifically, it was rather satisfying dusting off some of the cuts that haven't been heard from the stage in some time. "There were some we weren't sure of at first," he says, naming "Lakeside Park" as an example. "8ut once we started playing them, it was an opportunity to refresh them. 'Cygnus X-l' and the 'Hemispheres: Prelude,' it was really fun playing those songs; it reminded me of the level of energy we had in that period, and how we wrote and how we played and performed." Lee elaborates on the idea: "Something happens when you start playing those songs. You apply what you know now and bring a bit more of a mature attitude to the performance, and you actually start getting back into the headspace you were in when you wrote them. So as we were rehearsing, they kind of made sense again, and don't feel dated because it's like you're freshening them up." He uses "Jacob's Ladder" to illustrate the point. "That's always the number one song people ask us to play on fan petition sites leading up to a tour," Lee says. "And it went from being a song I found a bit cringe-worthy in rehearsal to one I loved playing every night." Part of that. he adds, can be attributed to the fan demand. "It's nice to be able to say thank you by playing songs that people really want to hear." Another aspect of R40 born of consideration for the fans that's also been a constant over the decades is the band's insistence on keeping their live selections as close to their respective album versions as possible. While there's always been room for a bit of improvisation, Lifeson asserts: "It's always been very important to us to replicate the songs as truly as we can." While hundreds of thousands of fans had a chance to bid farewell to their kings during the R40 Tour, even more will get to enjoy these songs and the unique way they were presented thanks to a live album and concert film. Recorded during the pair of dates at Toronto's Air Canada Centre in mid-June. 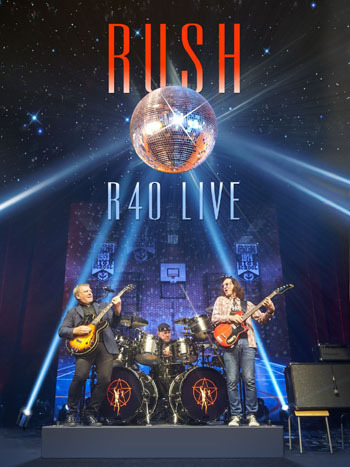 R40 Live drops Nov. 20th in CD, DVD, and Blu-ray sets. I'm very proud of the way it sounds and looks," Lifeson says of the band's 11th live package. "All in all. it's a very satisfying way to cap [R40]. It's not like we're leaving anything unturned." Lee takes over: "This whole tour was really driven by the fans," he says, reflecting on R40. "The design of the show, the song list, and a lot of the [video] content on the rear screen was all us saying thank you to our fans, because that's really the nature of an anniversary, in my view - especially due to the circumstances that this was our last tour, or potentially our last tour, so we really needed to say thank you the proper way." The Rush faithful have likely flagged the addition of 'potentially' to that last remark with a spark of optimism, and Lifeson puts a bit of fuel on that potential fire by adding, "I'm slowly getting used to the idea that we may not be touring anymore." The future, at least as of now, is uncertain for the trio, but regardless of what's in store, the members of Rush have done right by their fans with this most recent chronicle, and those fans will be held over thanks to R40 Live as they eagerly await any kind of word of what's to come. Andrew King is the Editor of Canadian Musician. 1972 Fender Jazz Bass (Black) - "My number one"